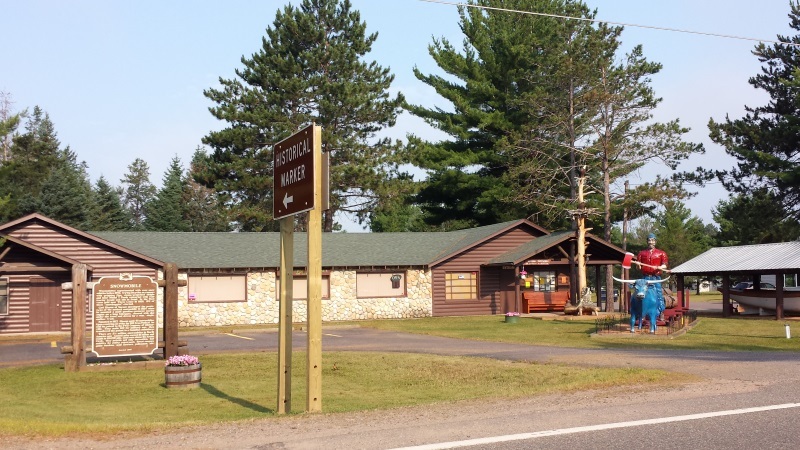 Billing itself as “The Northwoods the Way It Was,” the Vilas County Historical Society Museum on the south end of Sayner along Highway 155 chronicles the history of Vilas County and its communities. 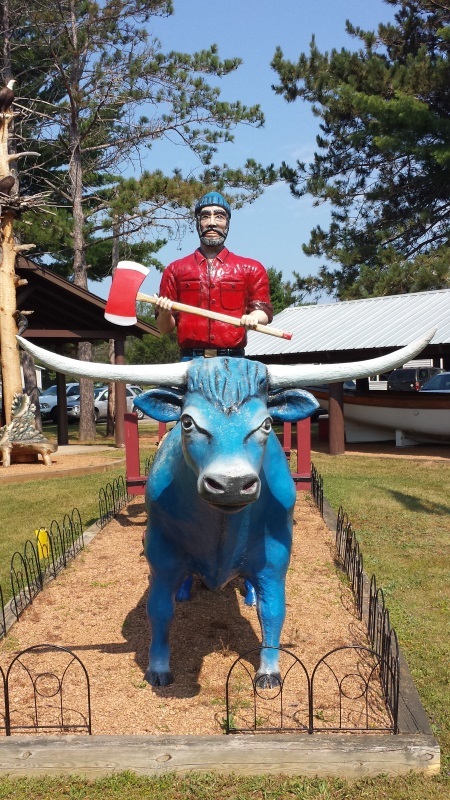 It’s pretty easy to find, with a large statue of Paul Bunyan and Babe the Blue Ox out front. The Vilas County Museum holds over 7,500 square feet of exhibits, displays, and artifacts. You’ll find a “Pioneer Room,” with antique housewares, stoves, clothes, and other sundry items that were part of early settlers’ days. There are also doll collections, native wildlife mounts, lures, boats, outboard motors, and Jim Froelich’s African Safari mounts. 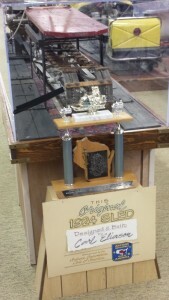 Carl Eliason’s original snowmobile, which started it all. Sayner is where the snowmobile was invented. 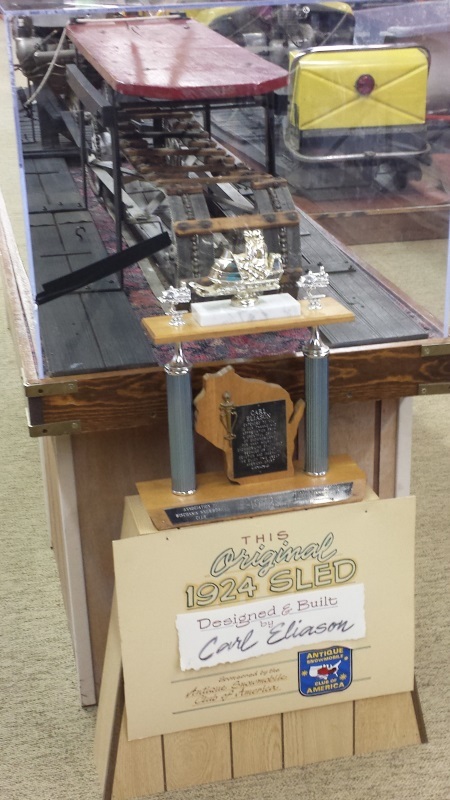 Along with an impressive collection of the sleds you can check out the original machine built by Carl Eliason in 1924 that secured the first official patent for the snowmobile. The Vilas County Museum is open seasonally, generally Memorial Day through the end of September. From late May to mid-June, the hours are 10am – 2pm, seven days a week. From mid-June 16 through the end of September, the hours are 10am-4pm – also seven days a week. Admission to the museum is $3 for persons aged 10 and up. Kids 9 and under are free. The Vilas County Historical Society Museum is right along Highway 155, about six miles north of Highway 70 in St. Germain. The Snowmobile Hall of Fame & Museum is in nearby St. Germain along 70 if you want to make it a “two-fer” day.